I came up with that term after working for several years with university students. Most of the students I interacted with had a fantastic freshman year, full of intense growth and exciting experiences. Although they began their sophomore year with anticipation, most became discontent, disillusioned, and critical. Of course, there were always exceptions, but the trend was so great and so terrible that it deserved a name. This summer closed the books on our second year of living overseas as a family. In the late winter, I had encountered my first personal sophomore slump. Just as I had never identified exactly what triggered university students to slip into it, I have yet to completely rationalize why and how my despondency came. I have no doubt that this is a common experience among people living abroad, and whether it comes in their first, second, or tenth years makes little difference. Even some of you who don’t live overseas may have experienced or may be experiencing a deep downturn. For that reason, I’ll write a bit about what the slump looked like for me. Crying. Lots of tears. For three months, from January through March, I cried every single time I went on a date with my husband. Once a week for three months. Can you imagine? My poor husband. We would be at a restaurant when I would break down, and because staring is accepted as normal in this culture, people would start looking. And because it’s rude to blow your nose in this culture, I would dab at my nose with dozens of tissues, while all of the people would stare even more at this strange foreign lady who had tears streaming down her face. What I can say for certain about those three months is that I felt as if I were drowning in purposelessness. And comparison wasn’t helping me feel any better. I knew coming in that I would have six months of resting and waiting to see what it was that I was supposed to be doing in this place while my husband was working. But after a year and a half of learning humility and patience, I was done. I found it incredibly stretching and difficult to have such a wide background in public speaking, administration and event planning, advising and supervising, leading and facilitating, and to now be known solely as the mother of three children. I wanted to be happy and thankful for the gift of time to work at home with my kids. While I had always viewed being a wife and mother as one of the highest callings, I couldn’t suppress the sense that there was something additional that I was made for and wanted to do. But I didn’t know what it was, and I didn’t want to add more activities to my life just to fill the void. At the same time, I felt alone. We were contemplating a change of schools for the kids along with a potential change of homes, the house we lived in had problems that I needed to somehow address with our landlord by using my broken Mandarin, one child developed itchy eyes due to an unknown allergic reaction, and another child began wrestling with questions of what is real. At the time, all of these things were under my jurisdiction. All together, they overwhelmed me. In the midst of that season, I had thoughts about my life that a person doesn’t dare to speak aloud. All I can say is that I am so thankful that I’ve been trained to reject those lies immediately and to replace them with truth. Having come out on the other side of those months, I’m amazed at the grace I received in the midst of it. I learned some things that seem now like no-brainers, such as the fact that I have a husband who is wise and can help me with some things! A group of extraordinary women from several countries unknowingly influenced our decision to keep our kids in the same school, and that decision was confirmed quickly after we made it. I saw clearly some of the darkness in my own soul that affected my marriage, and I kicked it out. My children have grown in relational and emotional development, and I’ve savored the deep conversations that we’ve shared together. I recently read a Psychology Junkie article from August 2, 2015 entitled How Each Myers-Briggs Type Reacts to Stress (And How to Help). While personality and temperament indictors do not dictate how a person lives, they can be helpful in understanding more about yourself and why you respond in the way you do. For me, this article stated what I experienced but would not have been able to put into words. Here are some of the things, according to the article, that stress my personality type. “Having to focus too much on sensory/concrete details” – check. Think laundry, housecleaning, cooking, and all of the tasks that consume a mother’s time. “An overload of sensory stimulation or noise” – check. Think renovations next door that sound like a jackhammer in your living room from 9am to 6pm, and when going out to get some relief from that, there are always the 24 million people who call this city home. “Interruptions” – check. What can I say? I’m a mom. “Not enough alone time. Too much extraverting” – check. People in my house, people outside of my house, people everywhere. “Lack of appreciation or understanding” – check. It’s getting better actually, but there’s not much affirmation by little ones for all the tiny things you accomplish for them each day. “Unfamiliar environments with overwhelming amounts of details” – check. Moving to a new country will do it. “Not being able to use their intuition or envision the future” – check. “Having to focus too much on the present” – check. Having a basic understanding of these stressors will hopefully enable me to take better care of myself in the future. I can find a place of quiet, I have a plan for alone time thanks to my husband, and I can let housework go sometimes so I can have space to dream. The most important thing is that I know Someone who gives hope instead of despair and joy instead of mourning. And that Someone has not abandoned me. I’m quite happy to say good-bye to year two because I’m planning to take into year three the things that I loved: my friends, my good conversations, my stronger marriage, my commitment to raising my children, and my joy. And junior year is always better. Eight years ago today, I married this man. I am so ridiculously blessed. That day in our small city was just like today in our expansive city: sunny, warm, a bit breezy. In a word, perfect. Fast-forward six years. My husband and I were happy and content, raising three kids in a good town surrounded by amazing people that we love. Then, over a year ago, Josh and I began talking in earnest about the possibility of moving to China. No concrete opportunity had presented itself, but his company was getting a new CEO and restructuring a bit, so it appeared that something could open up. I was intrigued at the idea of a change but also extremely hesitant, for several reasons. One day early in the summer, I got a babysitter for the kids and took my monthly required “retreat of rest”, as my supervisor called it. I walked through a local garden and spent some time talking with God. While there, I was reminded of a concept that I had lost hold of during the ups and downs of six years. During high school, I attended a church where we watched videos featuring Ray Vander Laan. He had traveled the Middle East and connected Jewish culture with the life and teachings of Jesus. So much more about Jesus made sense when understood in context. In one of the segments, Vander Laan explained the traditional process of betrothal. Of course, the process was intricate and the fathers of the woman and man were involved, but what struck me was the moment of the “ask”. The man took a cup of wine, drank from it, and offered it to the woman. This gesture was as if to say, “Here is my life and everything that it holds. Will you accept it?” If the woman drank from the cup, she essentially took the man’s life as her own. Whatever the “cup” of life held in store for them, they would take it together. On that summer day a year and a half ago, I pondered what it meant to take my husband’s life. Not in a “bumping him off” sense (obviously! ), but with the idea that the course of our lives would be one. Whatever he would be called to in the future, I would also be called to. I couldn’t honestly say that Josh’s interest in China blindsided me. After all, he had studied Mandarin in Beijing for two years, we met at a picnic for new Chinese international students the summer that he returned, he talked about China all the time when we were dating, and for our one-year anniversary he took me to visit Beijing. I could not claim ignorance. I knew what I was getting into. And yet, I had forgotten. I had forgotten that when I said, “I do”, I accepted his life. His course and direction would also be my course and direction. Let me clarify. Josh is not the kind of man who would dictate that I bow at his feet and yield to his wishes. I knew before I married that I needed a husband who understood my calling and could encourage me in it. In fact, the second time that we visited China together, it was because I realized that even as a mother, I had to continue to grow personally and to keep my love for the nations alive. And so it was that Josh took time off and we brought our toddler and several college students to China for a month. But the truth is that it’s hard sometimes to bend, to give a little or a lot, to live out the opportunity or dream of your spouse. Sometimes we ask the unvoiced question, “What about me?” I read a great book recently entitled Just How Married Do You Want to Be? by Jim and Sarah Sumner. They rightly noted that marriage is not a competition. Because you are ONE with your spouse, whatever success your spouse gains is your success as well. 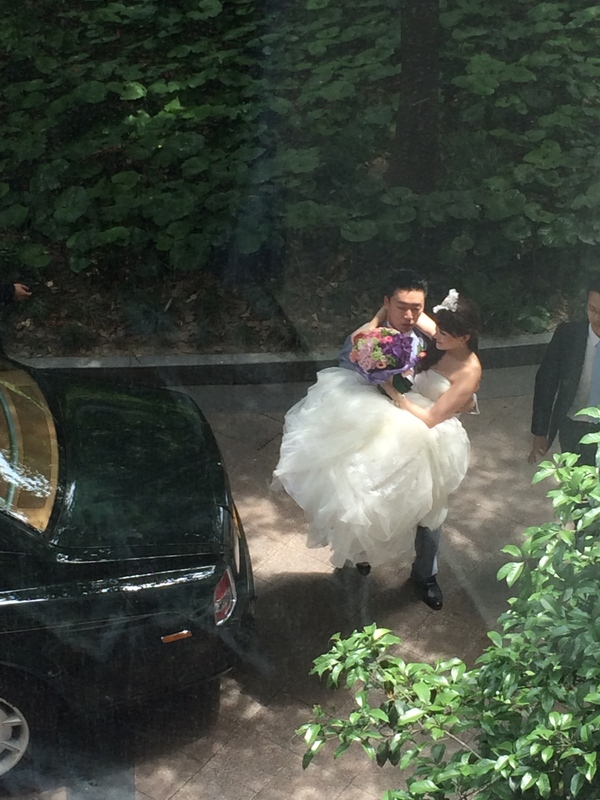 A while ago, we saw this bride and groom arrive to an apartment complex, preceded by shots of fireworks. I’m sure, like most of us, they felt full of anticipation, hopeful for their future together. Do any of us really get what it will mean, what it will cost us, to take on someone else’s life? Their successes, their failures, their dull days? Probably not. I think it’s the same for those of us who have given our lives to Jesus Christ. We don’t really get what it will mean, what it will cost us, to exchange our life plans for His plans. And yet, like marriage, this commitment sets us off on an unparalleled adventure. It’s totally worth it. 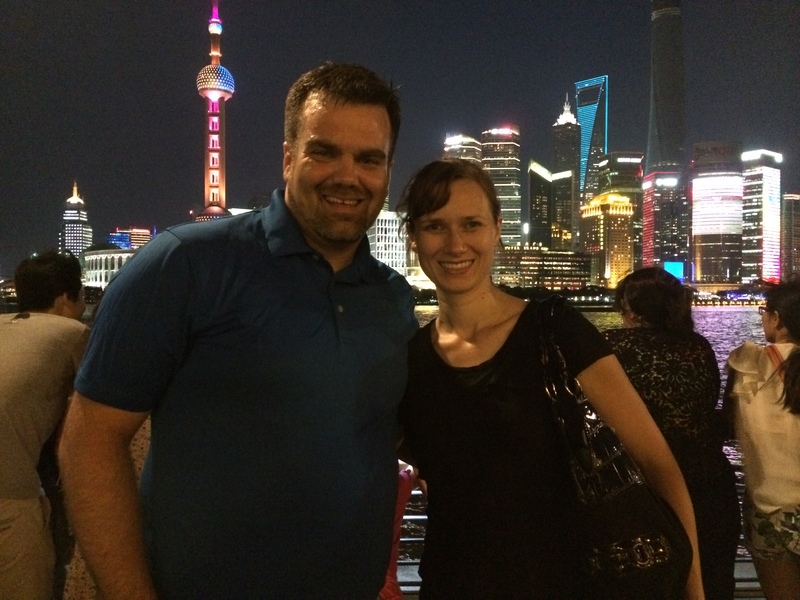 A friend asked me last week if I’m happy that we moved to Shanghai. I don’t know. However, I do know that I am happy to share this adventure with my husband. And because of that, there’s really no place I’d rather be.